Athletes Should Fear The Heat More Than The Heart Attack : Shots - Health News It's hard not to worry about heart problems when running hard in hot weather. But heatstroke is a far bigger health risk, researchers say. Marathon organizers are trying to make races safer. 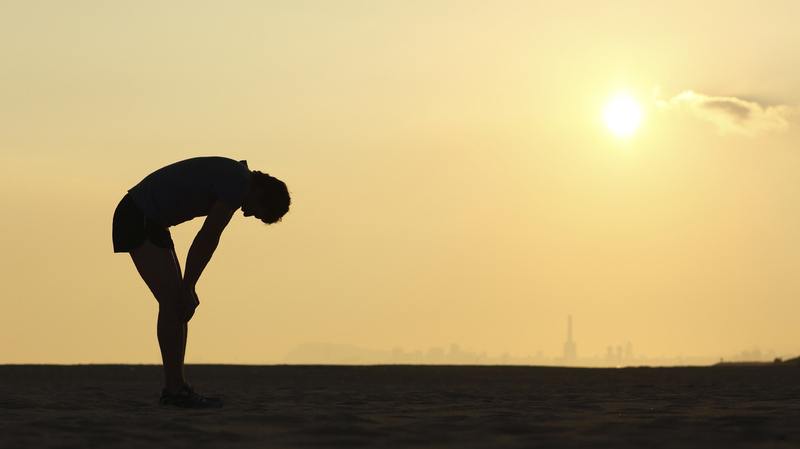 Some marathons are warning runners when conditions increase the risk of heatstroke. When a runner's heart stops during a marathon, it gets a lot of press — even though it's actually a pretty rare event. A more common killer among runners, and a condition that needs more prevention efforts, is heatstroke, according to a study by Israeli researchers. During a 2011 running race, physicians at a Tel Aviv hospital noticed there were far more heatstroke victims admitted than cardiac patients. They wondered if this was an anomaly, so they analyzed local races from March 2007 to November 2013, encompassing 137,580 runners. Across those races, there were two serious cardiac events, neither of which was fatal or life threatening. But there were 21 serious heatstroke cases, including two fatalities and 12 that were life threatening. There's a continuum of heat illnesses, ranging from milder heat cramps all the way to heatstroke, which is defined as a fever above 104 degrees and symptoms including dry, hot skin, rapid breathing and unconsciousness. When the body gets that hot, the kidneys, brain and other organs can fail. It's important for racers to be prepared for heat. That means acclimatizing to warmer weather — though that can take up to two weeks, so it's not always practical. The authors say it may be better to schedule races during the summer, when participants are used to the heat, rather than the spring. People also should beware of racing if they've recently had a fever, since that can reduce the body's ability to ward off heatstroke, the authors say. The National Athletic Trainers' Association also recommends drinking enough fluids before, during and after exercise to help avoid overheating. And race organizers need to be able to diagnose heatstroke quickly by taking a runner's body temperature rectally on site, so they can provide proper cooling, most effectively by immersing the person in a cold water bath. Now runners see green, yellow, red or black flags along the route to indicate whether the conditions, including weather, are good, less than ideal, potentially dangerous or so bad that the race has been stopped, Chiampas tells Shots. Post-race surveys show that runners run more slowly and adjust their strategy if conditions are yellow or red, he says. And medical personnel near the finish line are trained to talk with runners to see if their mental status has been affected — a sign of heat illness. The study was published Monday in the Journal of the American College of Cardiology.